Maryam Batool is a Pakistani young author of the self-published book of poems and essays called "My Maimed Life". Born in 1993 in the city of Gujrat, she was always engaged with the roots of literature’s passion. She contributed her creative writings on different websites “Poem. Club”, “Prince poetry .com (USA) , Federation of Writers Scotland, The World at School (African organization worked as a project writer ) and as well on her own Facebook page. She is doing Master in Statistics from University of Gujarat. But she always wishes to enhance her creative skills and has a passion to learn more about literature. In 2013 she joined the literary society at her university and attended few literary events. She also passed three online courses with certification regarding English writings from University of California and Harvard under the guidance of “Maggie Sokolik” and one course under the “Robert Silky” in “The Art and Poetry “. She joined Federation of Writers Scotland online in 2013 with the cooperation of Anna Clark. With her literary touch she also takes an interest in attending different conferences, workshops, etc as a writer, a participant, and as a guest as well. In 2014 she attended 1st national youth leadership conference at her university and 3rd leadership summit at GIKI 2014. She worked in Hayatian Quiz Society as a member which is striving for knowledge. Now she is working with the some US producers for writing a movie script. 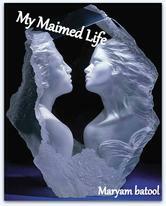 And now she holds the honor of her first poetry book at such a young age (21 years) “My Maimed Life”. In My Maimed Life mostly there are poems and I just penned about sad themes. There is one poem which relates with real feelings of mine “Stranger”. These are all ideas I just got from my surroundings. Did you have any goals for this collection when you wrote it —to get published, or just to finish, etc.? No I didn’t I just always wished that only a person read it who can feel my each word. Moreover, I just had a collection of writings so I thought to publish them. No, I never write in hours, even I don’t have an idea on how much time I daily spend because I just use to write at that time when I feel something in my stance. English is not your first language (I think). Do you write in your own first and have it translated? What is your process? Yes, English is not my native language even it was so tough for me when I used to write in English, but then on social media I got some authors from UK and they all are so kind and are in touch with me right now too. And one of my best friends, Geoff Cooper, is also poet. He helped me a lot in improving my writing skills even when sometimes I felt much sadness that my English writings are not going to improve. One friend from USA, Luis Coll, is IELTS teacher. He also suggested to me some online courses and I improved my writing and speaking as well via conversation on Skype with him. On history because I don’t have much idea about history, but I want to write on history at some point. I wish to visit “Goma Library”. it’s in Glasgow (UK). I have participated online in few poetry events organized by UK writer’s. It is the first library where first time my writings were appreciated. My own self is biggest fear for me when I am with furnace of my imagination. I don’t like holidays. I wish to keep my life busy that I may not able to think anything strange about myself. How hard is it to write and study for university at the same time? How do you fit in your writing? For me writing is not any task of duty, this is obsession for me and I enjoy being able to pen my feelings, so I never felt that I need to make schedule for my writings. I penned whenever I felt something. My silence sometimes and my sadness every day. Yes, I do believe in dreams. I wish to get my all answers about whole world either regarding humanity or religions. I am working on a movie script. It's African based theme. I hope it will come out soon.